Have you eaten a flower today? Americans are getting comfortable with the idea of edible flowers. But how—aside from sugar-candied flowers for bakers—do you use them? We asked horticulturist Nancy Clifton, who brought five really fresh ideas to the table. 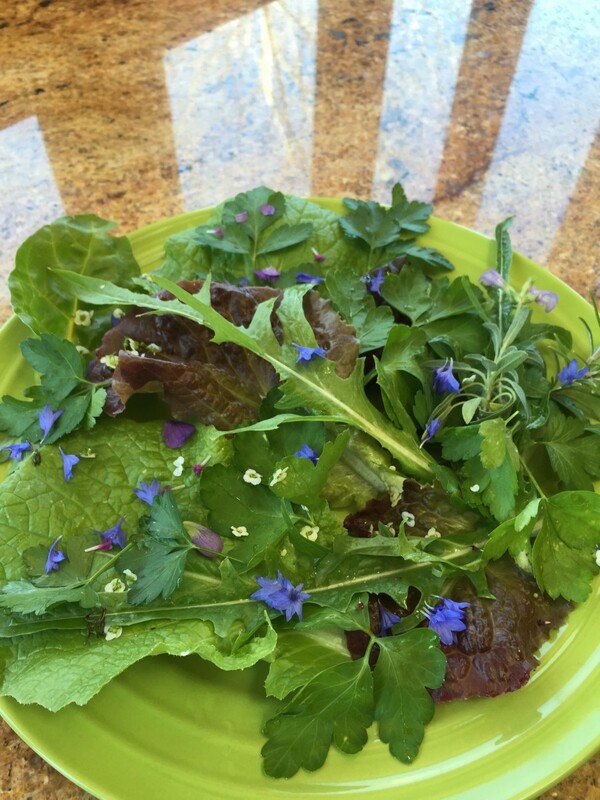 Today’s blue plate special: flavorful greens finished with blue flower petals. Gone are the days of a plain side salad on a white plate: today, even a tiny saladette is vibrant with color and flavors. Start with a blue (or green) plate. Add a piquant mix of salad greens (and reds), including baby chards and chois, and leafy herbs like parsley and cilantro. 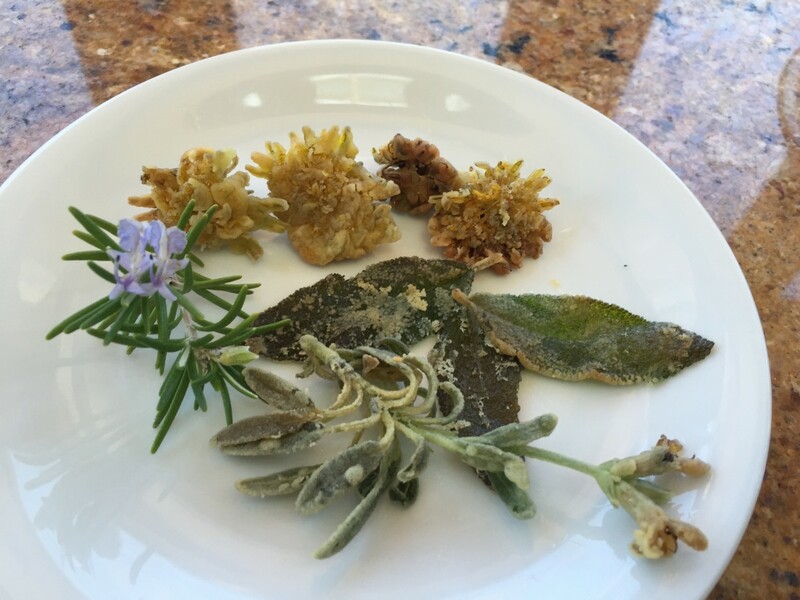 Then finish with flower petals: snip blue bachelor button petals to highlight that plate, dot white sweet alyssum among the greens, and trade the traditional sprig of parsley for blooming sage and rosemary. Nasturtium or chive flowers make a lovely pink vinegar. For a fruitier flavor, pour white vinegar over one cup of gently washed fresh raspberries. Wash one cup of nasturtium or chive flowers and let dry. Gently add flowers to a sterile quart jar. Pour in plain white or white wine vinegar to cover. Let steep for two weeks in a cool, dark spot. 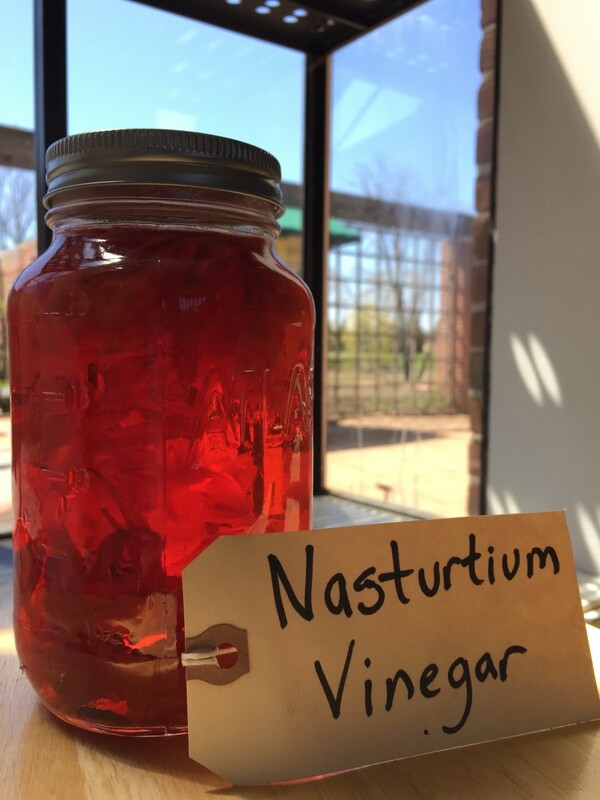 Strain vinegar into a fresh jar to use. Note how flowers have lost their color to the vinegar. Such beautiful pink color! Sprinkle as is onto leafy greens, or mix with oil and season to taste. Blue bachelor buttons, red cranberries, and white apples: a red/white/blue salad for the Fourth of July! 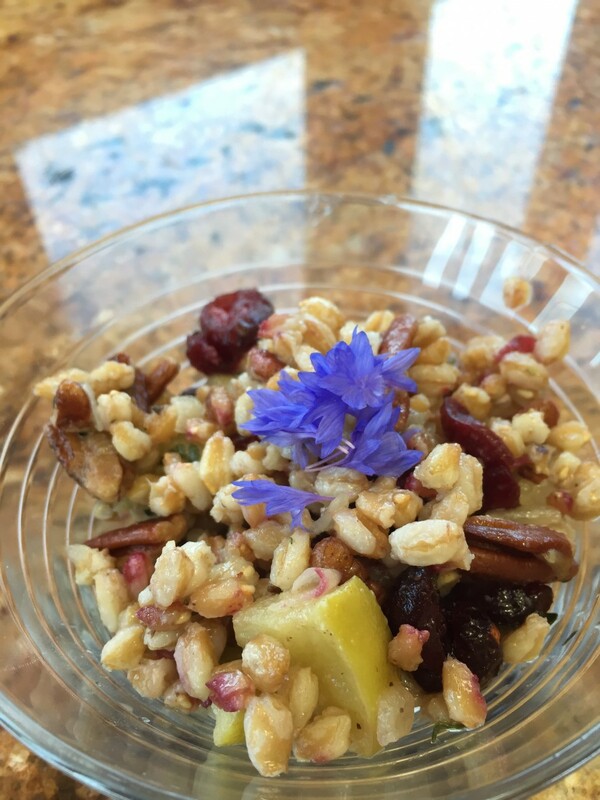 Also called wheatberry, farro makes a delicious base for a “superfood” salad chock full of fruits and nuts and topped with flowers. Nancy notes that all amounts can be adjusted to your preference. Toast ½ cup pecans in an oven or fry pan until fragrant. Set aside to cool, then chop. Sauté one small (or ½ large), chopped red or yellow onion in olive oil until translucent. Add one medium, unpeeled, chopped Granny Smith or gala apple to pan. Continue to sauté for 3 to 4 minutes. Remove from heat. Stir in fresh thyme (leaves of 2 sprigs) and ½ cup dried cranberries. Dress with a mix of 3 tablespoons apple cider vinegar and 2 to 3 tablespoons olive oil, seasoned to taste. Combine farro with the sautéed mix. Snip bachelor button or calendula petals and sprinkle over the top. Summer weddings, showers, and graduations call for a flower-spiked punch. Nancy likes the look of fresh ginger ale studded with a flower that floats. In the 1950s and ’60s, no punch bowl was presented without an ice ring. Nancy charmingly updates the idea for a homemade lemonade or champagne brunch punch, using fresh flowers. Try pansies or violets, or a mix of flowers and fruits, such as calendula petals with strawberries or bachelor buttons with blueberries. A crazy good ice tip: to make clear ice cubes (rather than cloudy) or ice rings, use distilled water or filtered bottled water—or boil and cool the water twice before adding to ice mold or trays. 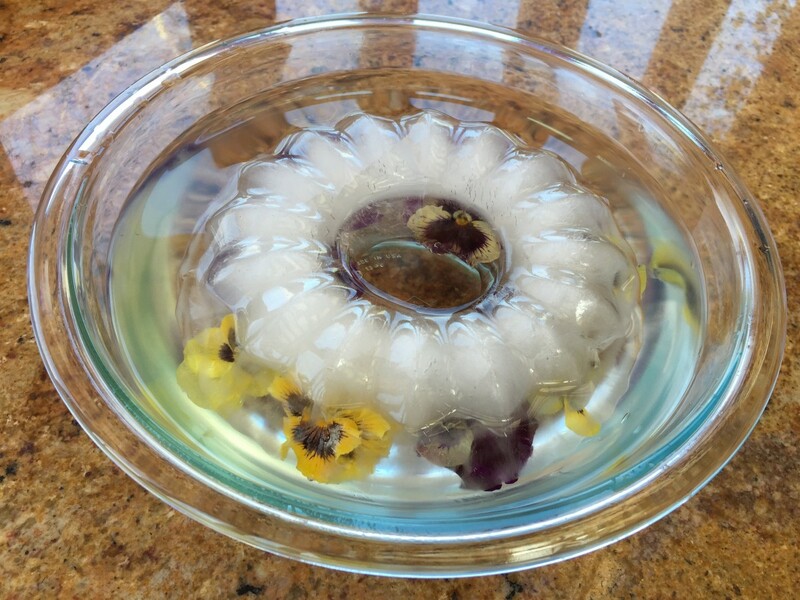 Line a bundt pan or jello mold ring with gently washed and dried pansies. Gently fill with water. The pansies will float to the top. When ready to use, dip the mold into a larger bowl holding an inch or two of hot water, which will loosen the ice ring. Invert and set ice ring into punch bowl. (Right side up or upside down? Either works.) Pour in punch or beverage of choice. 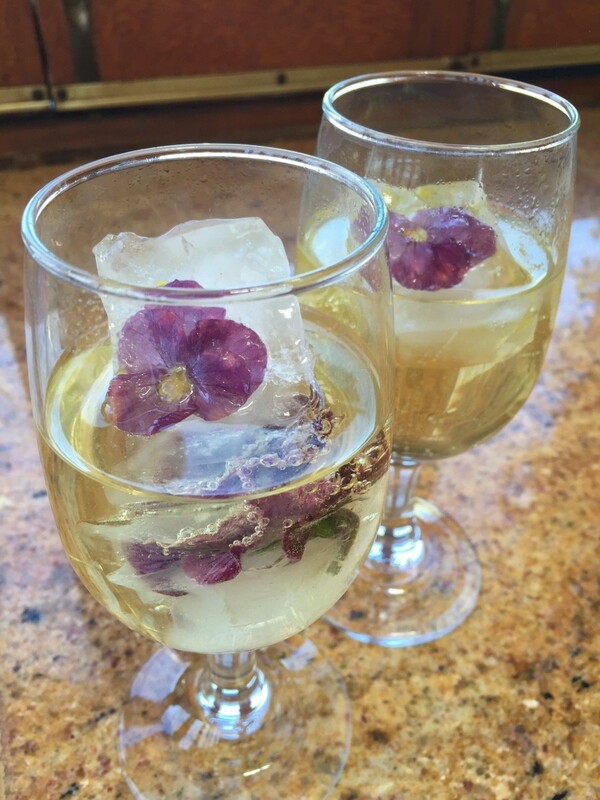 Floral ice cubes are great for summer parties, too: adjust the above directions for your ice cube trays. How do they taste? “Like mushrooms,” Nancy says. Dandelions are great as a conversation-sparking finger food! We didn’t believe it, either, but Nancy’s how-to-fry-a-dandelion demo changed our minds forever about everyone’s formerly least-favorite flower. Pick freshly-bloomed dandelions (just the blossom, no stem) from a trusted, chemical-free site. Gently wash the blossoms. While moist, lightly flour each flower (shake with ½ cup seasoned flour in a zip-lock bag). Heat ¼-inch of olive oil in a small fry pan. Gently fry flowers, turning delicately, until golden brown. Drain on a paper towel. Sprinkle lightly with salt. Fry fresh sage leaves alongside dandelions, then crumble both on salads. Next time you’re out at the Regenstein Fruit & Vegetable Garden, check out the spring edible flower bed in the Small Space area, where sweet alyssum, calendula, and dianthus are set off by towers of climbing peas for pea shoots—the new foodie rage! Use common sense before eating flowers. Know your flowers! Grow your own chemical-free flowers; don’t use unfamiliar flowers or those from non-organic sources. Our Plant Information staff has a good write-up about the difference between edible/inedible, plus a list of flower suggestions. More questions about what’s edible and what’s not? Call our Plant Information Service at (847) 835-0972.